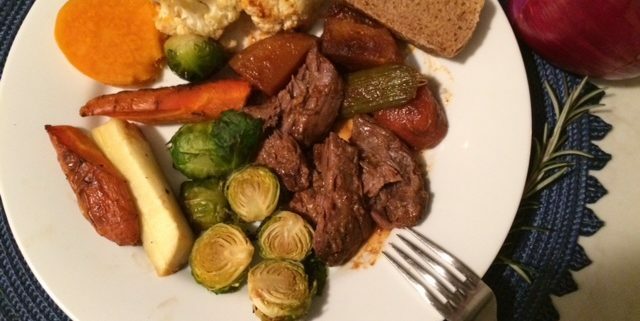 I TRIED “POT” & GOT A LEAN, HEART-HEALTHY BEEF DINNER! No cannabis involved. I’m talking about making my first pot roast and it turned out great. I’ve written earlier about my “grill-phobia” and how I conquered it. 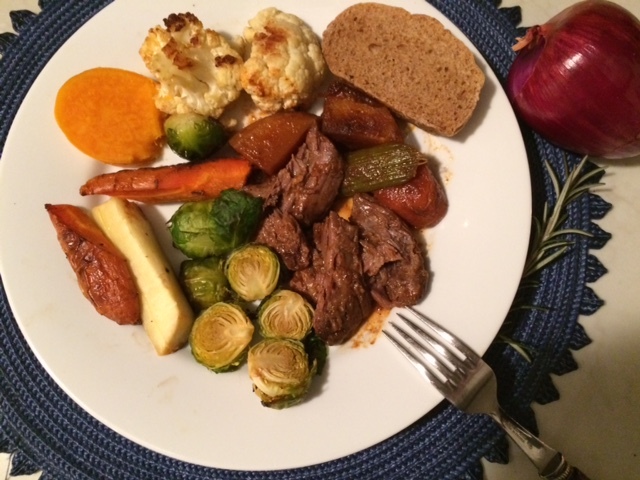 Pot roast was my next cooking obstacle to overcome. It’s also cold, we’re tired of winter, and we’re getting grumpy. We really want comfort food. And we want the kind of comfort food that doesn’t require too much prep work, either. But we need heart-healthy, too. I mentioned this dilemma to my 90-year-old mother and she suggested a pot roast. I always loved the one she made but figured it was beyond my culinary skills. Pot roast checked all my boxes though – it’s good comfort food, for sure. Thanks to some great info from the Beef Checkoff folks, at www.beefitswhatsfordinner.com, I learned it was lean (go for a boneless shoulder roast). As for the fuss-factor, the prep time was only about 30 minutes, then the oven does the rest. “Value added”: it lasts for more than one meal, tastes even better the next day, and has lots of veggies, so even more heart-healthy. • I cut some fat. Instead of 3 tablespoons of canola oil to brown the meat and 3 tablespoons of butter to sear the veggies, I used one scant tablespoon of olive oil for the meat and a dash more for the veggies. I grew up in an olive oil home and I see no reason to change. • Instead of 8 cremini mushrooms, I used a 10-oz package. Mushrooms add lots of umami and leftover raw mushrooms might go to waste anyway. • I only had a cup of red wine instead of the called-for 1½ cups, so I didn’t open another bottle. And it was merlot, not cabernet. It worked. • 4 cups of beef broth would have overflowed the pot, so I made do with about 2 cups instead, unsalted. I’d salt to taste later. One more little tweak: I added ¼ teaspoon of cinnamon. Mom said, “When you cook with tomatoes, add a little cinnamon. It really adds flavor.” Done. 1 rutabaga (yellow turnip), about a pound, peeled and cut into about 12 chunks. Not too small or they’ll break up. HINT: Do the above prep the night before. I did — it made the actual cooking faster & a blast! Sprinkle the roast with 1½ teaspoons of salt and a good amount of pepper. Heat a tablespoon of olive oil in a large oven-safe pot (I used a 6-quart Dutch oven) to medium-high heat, and add the meat. 3 or 4 minutes on each side sears it. Remove the meat and set it aside. Add another modest dash of olive oil and lower the heat to medium. Add the vegies, including the garlic, and stir it around to coat it and then occasionally, for about 8-10 minutes. Add the tomato paste and mix it in well. Stir occasionally for about 5 minutes. Add bay leaves, rosemary, wine, and broth and stir occasionally, until it seems like there’s a thick gravy, about 5 minutes. Preheat the oven to 340 degrees. Cover the pot and cook for about 2½ hours. Then let the roast sit for at least 10 minutes. Remove the bay leaves and rosemary and squeeze the garlic cloves out of their skins and back into the pot. The tomato paste (super-nutritious) and broth worked their magic here for a tasty, rich sauce. Salt to taste, but not until you’re ready to serve it — there’s so much flavor you won’t need to add much. Since the oven was on, I roasted a bunch of veggies to go with it. Meal’s complete! Would I make this again? Big “yes”, in a healthy heartbeat. 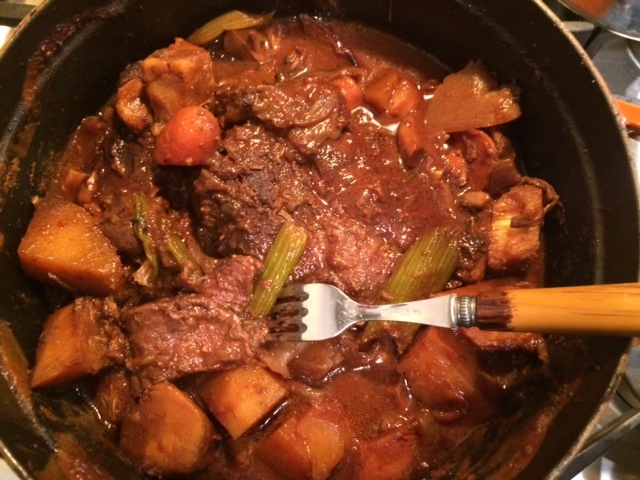 http://cuttothechasenutrition.com/wp-content/uploads/2018/02/Pot-roast-2-Ayoob-Feb18.jpg 480 640 Keith-Thomas Ayoob http://cuttothechasenutrition.com/wp-content/uploads/2016/10/logo10.png Keith-Thomas Ayoob2018-02-23 17:13:322018-03-16 23:51:24I TRIED “POT” & GOT A LEAN, HEART-HEALTHY BEEF DINNER!